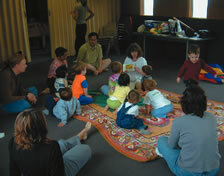 Children will have lots of fun while learning musical concepts in this class. This group approach to musical education will include singing, dancing, creative movement, voice development, storytelling, circle dances, exercises in rhythm, pitch and timbre, lots of instrument play, and much more. Songs and activities will be incorporated into the various themes and you will soon see your child singing and dancing to a new tune!